Welcome to the New Mexico Society of the Sons of the American Revolution (NMSSAR) website. Congratulations to Elijah Larson, Eagle Scout from New Mexico, whom was entered into the King Eagle Scout Contest of the National Sons of American Revolution by the New Mexico Eagle Scout Committee. Selection was very close as only a few points difference between third place and first Place. "Congratulations! Eagle Scout Elijah Larson was selected as the THIRD PLACE entrant in the King Eagle Scout, Sons of the American Revolution National Contest and will be awarded $4,000 for, his superior scouting achievements and outstanding essay, his future college fund. An excellent selection by the New Mexico Eagle Scout Committee." The Eagle Scout Committees excellent choice of the eagle scout entrant from New Mexico was very difficult and guidance by them to the eagle scouts in completing their applications properly. Welcome to the New Mexico Society of the Sons of the American Revolution. As 2013 President of the New Mexico Society, I extend our entire membership's greetings to you. The New Mexico Society of the Sons of the American Revolution (NMSSAR) has been in existence since 1908 and currently consists of four chapters. The oldest chapter is the Albuquerque Chapter followed by the Santa Fe chapter. The Gadsden Chapter in Las Cruces was formed in 1986. The newest chapter, formed in 2012, is the Three Rivers Chapter in Farmington. Altogether, the entire Society consists of about 109 members who live throughout the State of New Mexico. New Mexico is the fifth largest state in the United States of America. To recruit new members and to grow the organization.� The median age of NMSSAR's membership is almost 67. NMSSAR needs to induct new and younger members, and each chapter has been challenged to set a goal to induct at least three (3) new members in 2013. To update and publish the NMSSAR Handbook, Constitution, and By-Laws. Several years ago the Society began an update to the Duties of the Offices of the Society.� Our goal this year is to review and complete that effort, as well as the complete update/rewrite of the State Constitution and By-Laws. To publicize and maintain NMSSAR activities in the newsletter: In this NMSSAR website can be found every quarterly issue of the New Mexico Society of the Sons of the American Revolution. These issues show the exemplary activities of our New Mexico chapters. To acknowledge local police, firefighter, and emergency medical personnel with SAR awards: Each Chapter is seeking to identify deserving personnel to receive recognition from the Sons of the American Revolution. To maintain Support at both the State and Chapter level of the ROTC program, and to expand the coordination and recognition of the ROTC programs and Essay Contests. To develop and expand the NMSSAR support of the Eagle Scout program. To develop, recruit, and train new officers at both the State and Chapter level. 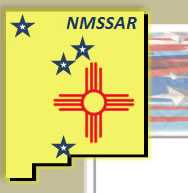 To update the NMSSAR historical record: NMSSAR is older than the State of New Mexico. New Mexico achieved statehood in 1912 and 2012 was New Mexico's Centennial. The NMSSAR was founded even earlier than the State - 1908. A published history of the NMSSAR Society from 1908 until 1979 exists. In an ongoing effort the new State Historian has been charged with the task of researching and bringing the NMSSAR History up to date from 1979 to the present. To make the NMSSAR color guard widely available to the New Mexico community: Please view the various sections in this website of the NMSSAR Color Guard under the inspired leadership of Color Guard Captain George Garcia. For example, one picture shows New Mexico Governor Susana Martinez with members of the NMSSAR Color Guard. A number of other pictures show the Color Guard in a variety of settings, including one in Santa Fe with the Spanish Ambassador to the United States of America. The NMSSAR Color Guard welcomes any donation made to the Color Guard to help with the expenses of procuring, maintaining, and storing of the Color Guard Uniforms.� In addition there are the expenses and travel involved in the many requests for appearances that the Color Guard could use some assistance with, as well as recruiting new members. Whether you live in New Mexico, or are just visiting, we hope you will visit our website again and find out more about NMSSAR. The Webmaster, William H. Baker who is a member of the Gadsden Chapter, is attentive in keeping the materials herein fresh and current. NMSSAR is an active society that welcomes visitors. Look through the calendar to see where and when each Chapter meeting will occur.